In a competitive marketplace, there is increasing pressure to improve color quality in the lab and in manufacturing to reduce rework due to errors and to deliver a faster time to market. The Ci4200 is an affordable benchtop spectrophotometer for small to medium-sized manufacturers across a variety of industries who are aspiring to implement a higher degree of color formulation and color quality control in their product development and production processes. When combined with a tiered offering of Color QC and Formulation software applications, it scales to support an evolving color program. The advanced Ci4200UV adds the capability of self-calibrating UV illumination to accommodate evaluation of the effect of optical brightening and fluorescing agents that cause color to shift under different lighting conditions. Using standard measurement methods, immediately identify variances in color and gloss to ensure accurate color readings or to verify visual inspection (SPIN/SPEX). Produces correlated 60⁰ gloss value for more accurate assessment of sample gloss in compliance with ASTM D523 and ISO 2813. With its embedded NetProfiler, manage performance and enable consistency across the supply chain regardless of where instruments are being used. Features data compatibility with X-Rite handheld spectrophotometers such as the Ci64 for ease of data exchange across the operation. LED membrane provides status and operation feedback with remote trigger and samples can be viewed and targeted with a sample arm for overall ease of use. 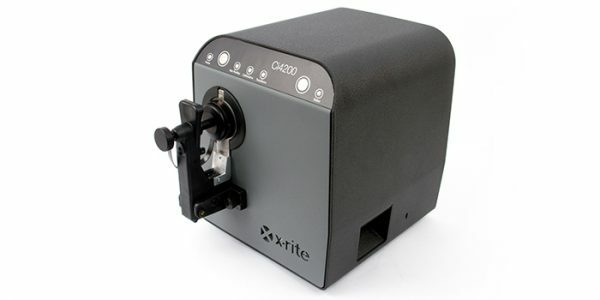 The Ci4200 is a reliable and accurate compact benchtop spectrophotometer that serves as the foundation for operations seeking to establish a color control program or those looking to improve an existing program that currently relies on non-spectral devices or visual inspection pass/fail methods. The result is a streamlined color workflow that delivers more accurate color performance.